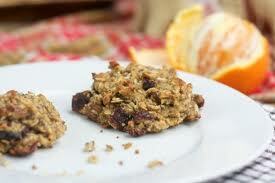 My friend gave me this recipe for "healthy" cookies. I guess really healthy people reserve these for their treat, but I justify eating them all day long because they have so many healthy ingredients. bake at 350 for about 15 min. I made these mini-quiches (hate that word- and you know why, so they will henceforth be called cheese-baskets)for a brunch yesterday and they were a big hit, and totes easy. Blend together eggs, cream, flour, and salt and pepper. Set aside. cut pastry dough into squares and place them into a greased muffin tin. Bake for 5 min at the recommended temp. on the package. 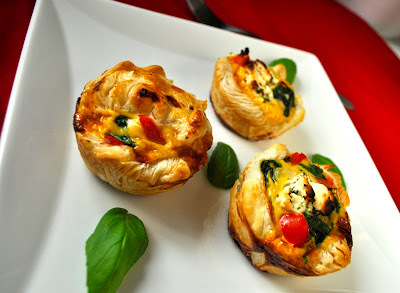 Take the tin out of the oven and sprinkle basil, tomato, and goat cheese into each cup. Pour the egg mixture into each cup, filling about 3/4 of each cup. Bake for about 15 min @ 400 (keep an eye on it though, because I can't really remember how long I kept them in for). Post your favorite quiche filling combos in the comments so I can try them! !